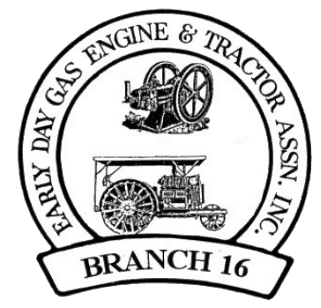 John Berry and James Haynie of Ash Grove Missouri started the Gas Engine Club in 1971. They had written to the EDGE & TA and inquired as to what the rules were to join the national organization. The first meeting was November 23, 1971 at the home of John Berry. There was 6 inches of snow on the ground and it was 4 degrees below zero that night. There were 13 people in attendance and that was how many they needed to become a branch. On December 17, 1971 they received the charter from the national. From that cold night in 1971 we have grown to 150 members today. We have our show every year in conjunction with the Ozarks Steam Engine Association. The Gas Club built a pavilion on the ground for the enjoyment of both clubs. We presently meet the first Saturday night of the months Oct, Nov, Dec, Jan, Feb, Apr & May at the Library Center in Springfield. March is a joint meeting between both clubs and Aug. we go to the Ash Grove Park. The other months we meet at the Steam Grounds for picnics. Contact Branch officers listed above, or go to our Branch Website or Facebook Page for more information on Branch 16, attending or participating in branch events.